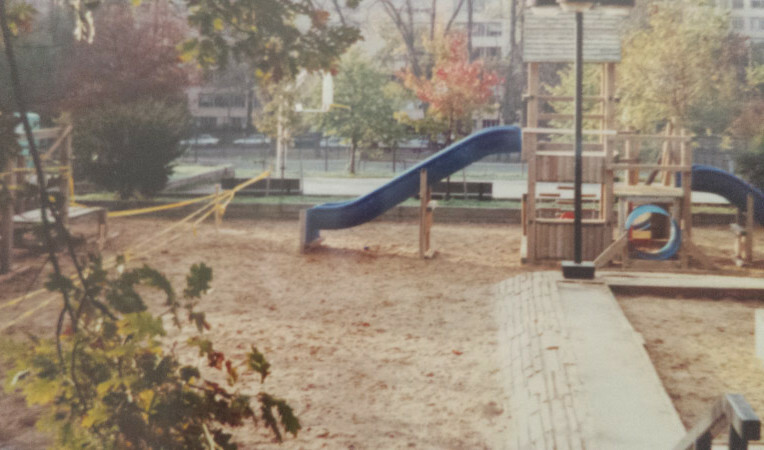 The currently-bare Forest Hills playground raises many wonderful memories of spearheading a community effort to renovate this play area 25 years ago. It was also a great way to meet the neighbors after my family and I moved to Forest Hills in 1989. 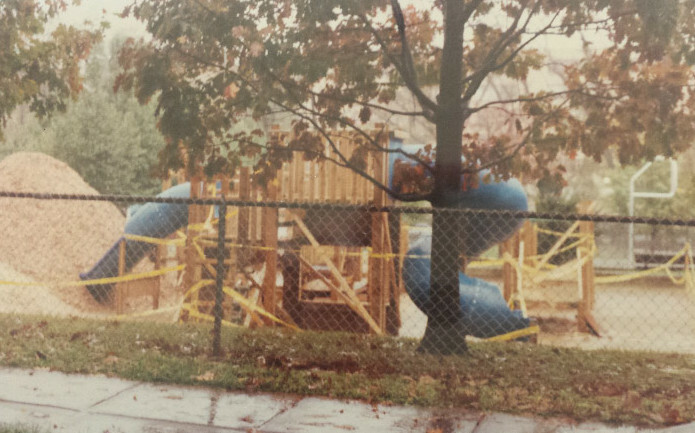 Moving from Dupont Circle, I was shocked by the condition of our playground compared to Dupont’s community playground at Mitchell Park, on S Street across the street from the Textile Museum. Our new neighborhood’s playground cried out for a makeover – bathed in hot sun with poorly designed and maintained playground equipment. And I rarely found anyone there. Where was I going to meet other families? 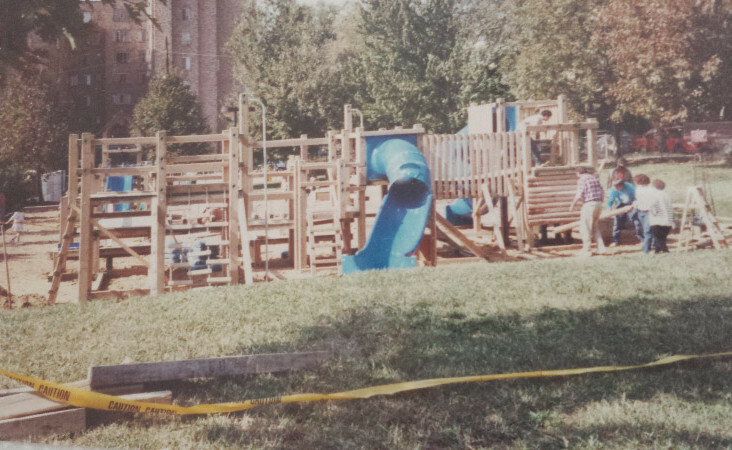 I was a fervent playground parent, having made my contacts with other families in the Dupont Circle neighborhood at Mitchell Park. It may seem hard to believe now, but back in the mid-80s, Dupont Circle was hopping with young families. But crack cocaine had chased us out of our old neighborhood, though I was hesitant to leave because of all the amenities of urban life. Forest Hills felt like a different world. But here was this playground begging for attention. Since organizing is in my blood, and complaining about the sorry state of the playground wasn’t going to help, I decided to collect a group of neighbors to raise money for the renovation of the playground. I thought this would be a win all around: I’d get to meet other great Forest Hills families while working to get the playground I wanted and this neighborhood deserved. I gave myself a year to get this done, and I worked my tail off. Luckily I knew Rita and Poul Arendal, who lived close by. They were active in the Forest Hills Citizens Association and pointed me in the right direction. I managed to get a group together, with Susan Crudgington and Susan Vener (she added Linsky later) joining me to lead this group. We became the triumvirate and raised $45,000 from block-to-block solicitations. Joyce Deroy kept track of everything on her Excel spreadsheet. She was a very early adopter of technology. We got a grant from the Forest Hills Citizens Association, and trees donated (the ones on the playground itself) and planted by the Hillwood Museum. I scoured playgrounds to find play equipment maker I liked. I wanted physically-challenging equipment that also looked good. My children loved the creative equipment at Cabin John Park near the ice skating rink, so I talked to the Montgomery County park ranger who had chosen it. It was from a company located in Boston. I went up and visited them, and they took me around to various playgrounds they had done in the Boston area. I came away wanting them to design our equipment. They came to DC to present to our committee and told us we could save a lot of money by installing the equipment ourselves under their supervision. It was unanimous that we would go with this company. 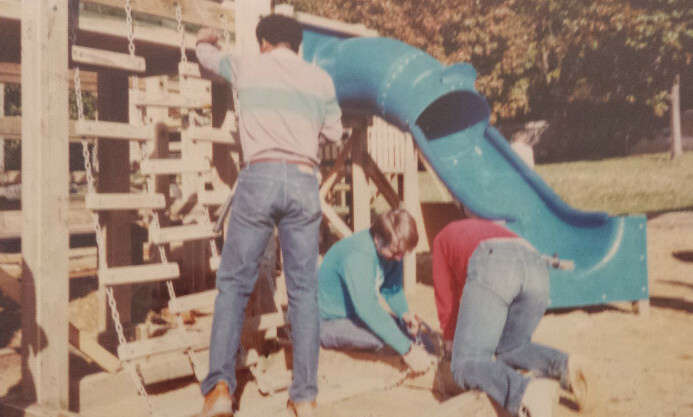 And so, about a year after we started organizing for this playground in 1989, we were ready to begin installing the equipment. Susan Vener and I checked on the equipment through the few nights that it was stored at the site to make sure nothing happened to it. We breathed a sigh of relief when the big day came. Wendy Raines recruited many volunteers with the enticement of a pot luck dinner at her home after we had completed our work. We had a blast putting up our own equipment. Starting to assemble the equipment. 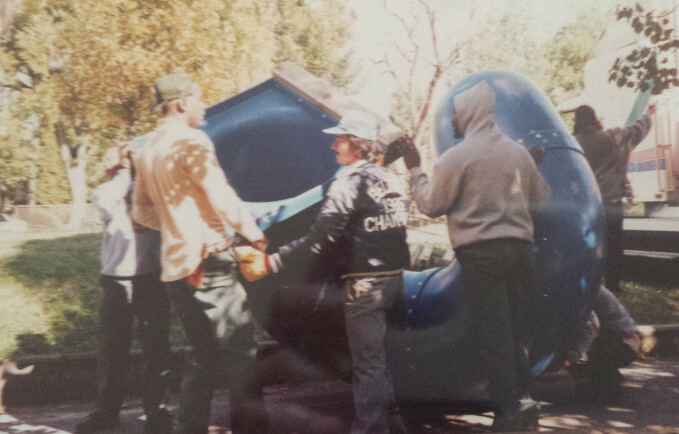 People were lifting and assembling under the superb direction of our supervisor, who was put up at one of our homes. Frank and Wendy Raines working working with Paul Arendal. Then we had to make sure no one used the playground until it was inspected by the Department of Parks and Recreation. Luckily we had Neil Rodgers, the DPR rep on our committee, who helped pave the way for a timely inspection. Large play structure, almost done. Large play structure awaiting inspection. The play equipment we installed that day was replaced long before the current renovation, but the trees from Hillwood still grace the playground and will continue to do so. And most importantly, the playground has been reclaimed and remains an important piece of our neighborhood fabric. 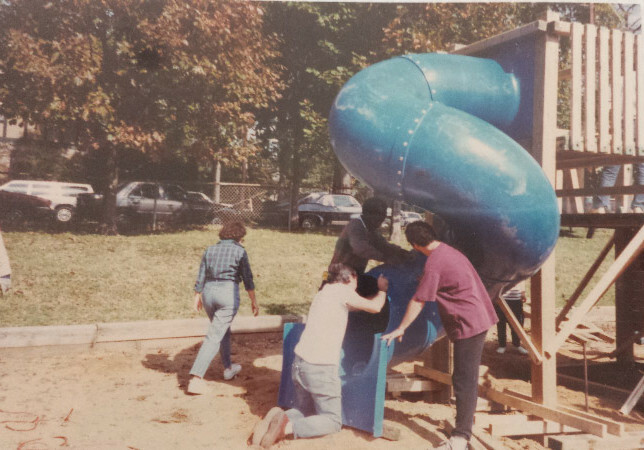 I keep reading about this playground but have no clue where it is located. Could you please an address. Thanks. It’s between Brandywine and Chesapeake, just east of Connecticut Avenue. 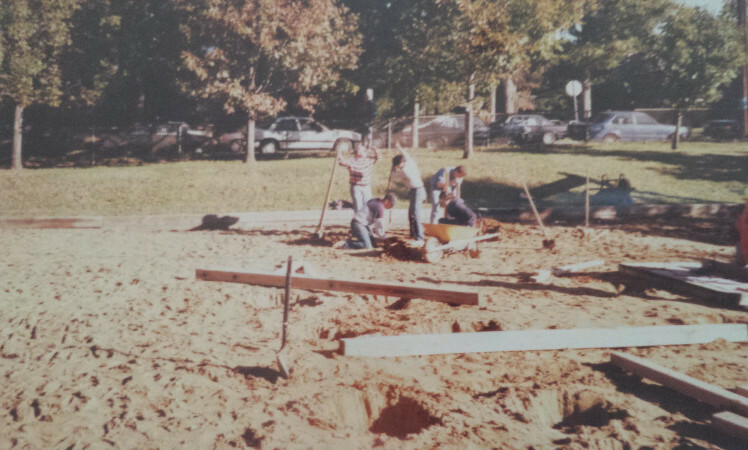 Thanks for this, the photos stir beautiful memories of the old playground and the community makeover about 10-12 years ago.